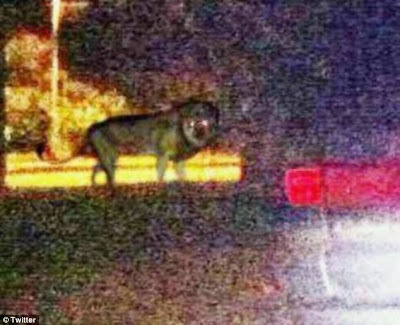 A Stranger Earth: Essex Lion... Oh Dear. The UK, more precisely Essex, is in the grip of a big cat scare. This is hardly surprising as we in this country aren't strangers to big cat sightings, as we've seen before, but this time it's a lion! Being the sceptical sort, I expected this to be yet another case of mistaken identity or a hoax. How wrong could I be? There are pictures! Firstly, this may not be the "real" photo shown to the police. Well I hope it wasn't. Secondly. Can you see that photo? Does it look even remotely like a genuine photo? Not to me. The lighting is just totally wrong. Maybe it is genuine but if so... it's the worst genuine picture of animal seen since my dog attacked me while trying to photograph him.